Sowing Creativity is an integrated visual arts residency program developed by the San Jose Museum of Art to address the new California Common Core State Standards and to meet the urgent need to promote creativity across disciplines. The premise: well-honed visual thinking abilities contribute powerfully to the teaching and learning of specific cross-disciplinary concepts. Sowing Creativity brings elementary school classroom teachers together with teaching artists from SJMA and science instructors from the Youth Science Institute (YSI) to promote student creativity and success. Well-honed visual thinking abilities can contribute powerfully to the teaching and learning of specific cross-disciplinary concepts. An investigation of perception, defined as “a thought, belief, or opinion, often held by many people based on experience,” encourages students to explore both the seen and unseen. A rich sequence of hands-on art making lessons and inquiry-based discussions of contemporary art helps students to understand the shared art and science concepts of perception, perspective, optics, light, and color theory. The integrated curriculum, developed collaboratively by SJMA’s teaching artists and YSI’s science instructors, leads students to ask and answer two essential questions: How can I look at the world differently? What is the science behind looking and seeing? Sowing Creativity is rooted in a number of educational frameworks. Following the national shift to Common Core standards, the program promotes an integrated approach to the big-picture questions at the intersection of science and art. The curriculum aligns itself with the newly implemented Next Generation Science Standards and the California Visual and Performing Arts (VAPA) Content Standards. It is informed by the research-based initiative to add the arts into the nationally dominant science, technology, engineering, and math (STEM) curriculum. The shift from STEM to STEAM fosters true innovation founded in the belief that by developing students’ abilities to use knowledge across contexts the arts can play a vital role in promoting the four C’s of P21’s 21st-Century Learning Skills: creativity, critical thinking, collaboration, and communication. The program has also adopted the Studio Habits of Mind framework for teaching and learning in the visual arts as developed by the Harvard Graduate School of Education’s Project Zero. Before beginning Sowing Creativity, a required meeting with the principal, participating classroom teachers, and SJMA educators takes place at each school-site. These meetings are a platform for communicating, collaborating, and finalizing the logistical details of the program before implementation. An experienced SJMA Teaching Artist leads weekly, hour-long artmaking sessions in each participating classroom. Students experience a series of hands-on projects in a range of processes that may include drawing, painting, printmaking, photography, and sculpture. All materials, including a sketchbook/scientific journal for every student, are provided. In coordination with each school’s Teaching Artist, the Youth Science Institute (YSI) leads a corresponding hands-on science lesson in each participating classroom. Students, teachers, and chaperones visit the museum to experience art as viewers, makers, and community members. The Two-Part Art field trip includes a one-hour, inquiry-based tour of selected artworks with an SJMA Gallery Teacher, followed or preceded by a corresponding one-hour, hands-on artmaking workshop with the school’s Teaching Artist. An informational packet is offered to all participating teachers in an effort to help develop classroom connections to the Sowing Creativity program. The teacher resource guides offer optional pre- and post- program activities as well as grade-appropriate suggestions for related books, videos, websites, and other local resources. Each participating classroom teacher and school principal receives a one-year Individual membership to the San Jose Museum of Art. Benefits of the membership include free admission for yourself and one guest, invitations to exhibition receptions and members-only events, discounted tickets for programs and lectures, SJMA e-News subscription and e-updates, and a 10% discount in the Museum Store and Café Too! Each Student receives a free family pass for up to 8 family members to come and visit the museum on their own. In addition to formative teacher and student assessments, participating teachers are also directed to an online survey to provide feedback at the end of the program. Sowing Creativity: “Engineering and Art” for 5th grade! For more information, or to apply to be one of our test classrooms, contact education@sjmusart.org or call 408.291.5393. 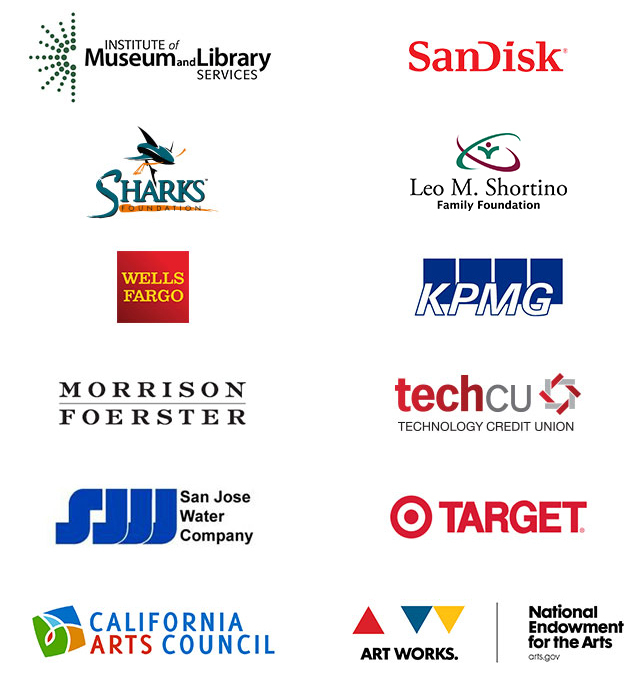 Sowing Creativity is supported by generous funding from SanDisk, Sharks Foundation, The Leo M. Shortino Family Foundation, Xilinx, Wells Fargo, the House Family Foundation, KPMG, Morrison&Foerster, SV Creates, Tech CU, Mission City Community Fund, Daphne and Stuart Wells, San Jose Water, and Target. This activity is supported in part by the California Arts Council, a state agency, and the National Endowment for the Arts, a federal agency. Sue Shellenbarger, “New Approaches to Teaching Fractions,” The Wall Street Journal, 24 September 2013.